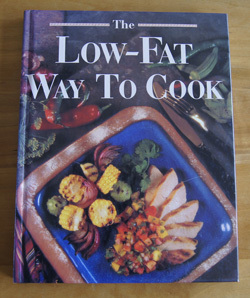 Cookbook #31: The Low-Fat Way to Cook. Oxmoor House, 1993. I have used this book a lot, both as a reference on low-fat cooking and for recipe ideas. I’ve made the Dijon pork chops and sweet and sour chicken many times, although I’d forgotten about them until I pulled this book from the shelf. This book is an old friend. This is a large hardcover book with good color photos. The recipes are easy to follow and pleasantly laid out. It’s not very personal; this book has editors rather than an author. Nutrition information is given for each recipe. Most main dishes are 250-400 calories per serving. I pretty much cook the way this book outlines. Since it’s a 1993 book, I was already cooking like this when I purchased the book, so I guess I wanted reinforcement and recipe ideas. So what are low-fat guidelines? Choose lean cuts of meat, poultry without the skin, and fish. Bake or broil instead of frying. Use vegetable cooking spray or when absolutely necessary, reduced calorie margarine. Braise tough cuts of meat (long, slow cooking). En papillote cooking is great – this is cooking in paper packets. Top pot pies are topped with phyllo sheets rather than fat-filled crusts. Choose low-fat dairy products and use egg substitute or egg whites. For baking, use very little oil and incorporate vegetables, fruits and whole grains. Beyond the above suggestions, this cook book encourages the reader to watch serving size and read labels. Page 17 has a great chart of “serving sizes”. I like this cookbook a lot better than the Cooking Light Cookbook 1992, which was the first of my 250 Cookbooks posts, and also an Oxmoor book. The recipes in this cookbook don’t call for all sorts of weird ingredients – they call for items I already have in my pantry/refrigerator. Sensible. So what recipe to try? I am going to “try” Sweet-and-Sour Chicken. Now, I have made this before; I have a post-it next to the recipe stating that it is “pretty, spicy and thick sauce, good with pork too”. But I had forgotten this recipe, and it’s time to try it again. Sweet-and-sour dishes need to have just the right combination of vinegar and sugar. This is one time when I actually carefully measure the vinegar and the sugar. Other than that, this is a really simple dish. Just stir fry the vegetables and the chicken, then add the sauce and heat. Takes about 10 minutes to cook. I have another sweet-sour recipe in my repertoire and I am incorporating an idea from it: onions. 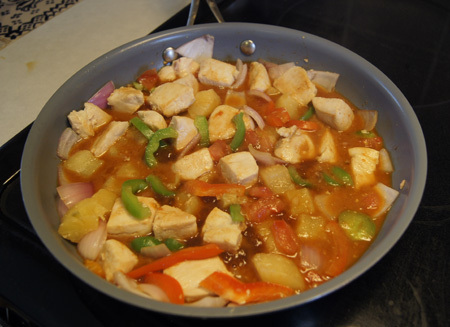 I like onions in my sweet-sour dishes, so I include them in my written recipe below. I also like a touch of tomato. And, you can add carrots and use fresh ginger instead of powdered ginger. Hey, recipes are guidelines, not written in stone! Drain the pineapple chunks, reserving juice and setting the chunks aside. Combine the juice with the vinegar, and the next 7 ingredients (soy sauce through garlic powder) in a small bowl or measuring cup; stir well and set aside. Heat a nonstick pan over medium-high heat until it feels hot when you hold your hand an inch above it. Then, coat it with cooking spray and add the chicken and cook 5 minutes or until chicken is browned on all sides. Add the peppers and onion (and carrots or any other veggies you are using) and cook 2-3 minutes, until the veggies are crisp-tender. 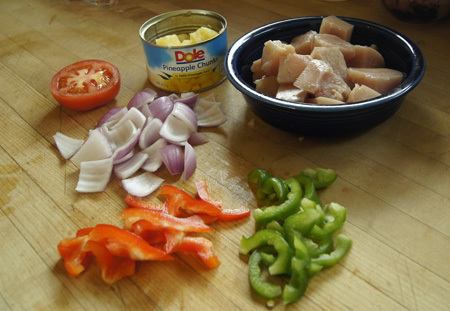 Add the pineapple chunks (and the optional tomato) and stir a minute to heat through. Give the pineapple juice mixture a good stirring to distribute the cornstarch, then slowly add it too. Cook over medium heat, stirring constantly, until thickened and bubbly. It only takes a couple minutes. It’s ready to serve, over your favorite type of cooked rice! At the preparation point when I took the above photo, I hadn’t decided to add the tomato or not, so it’s sitting there uncored and unpeeled. Below is the cooked dish. This entry was posted in 250 Cookbooks, Main Dishes, Poultry by admin. Bookmark the permalink.